Make a bold statement in the Ocean Palm Dress. A-line silhouette. Palm print on a lightweight rayon fabrication. V-neckline. Short sleeves. Knot-trim detail at front. Concealed zipper closure at side. Lined. Straight hemline. 100 percent rayon Lining: 100 percent rayon. Hand wash cold and hang dry. Imported. Measurements: Length: 34 in Product measurements were taken using size SM. Please note that measurements may vary by size. Elevate your style in this Brighton Jumpsuit. Relaxed fit. Stripes allover a cotton design. V-neckline and back. Short split sleeves. Tassel ties at nape, sleeves, and waist. Stretch waist. Dual hand pockets. Lined. 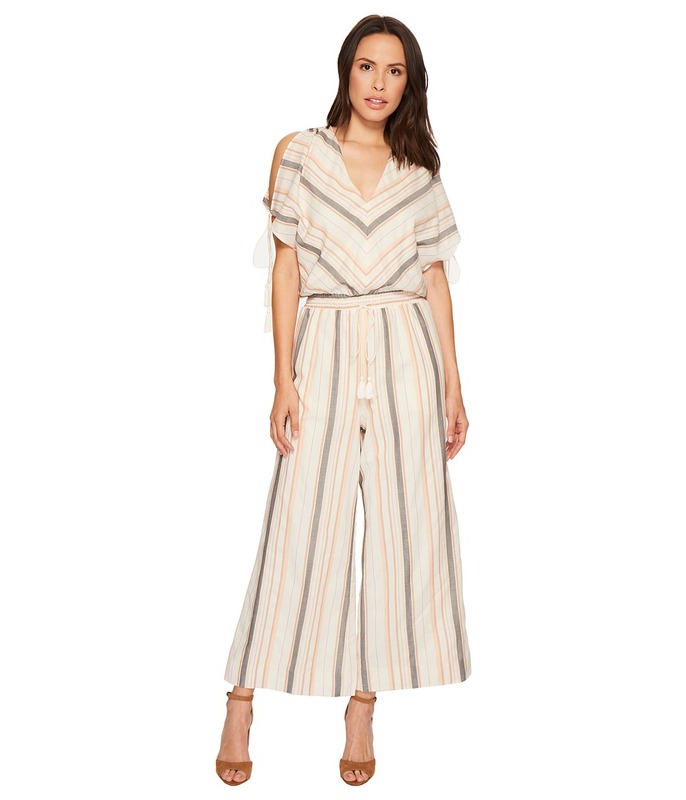 Wide leg at a cropped length. 100 percent cotton Lining: 100 percent rayon. Hand wash cold and hang dry in shade. Imported. Measurements: Inseam: 26 1 2 in Shoulder to Crotch: 33 1 2 in Shoulder to Toe: 57 in Product measurements were taken using size SM. Please note that measurements may vary by size. Take style to new heights in this Zissou Midi Dress. 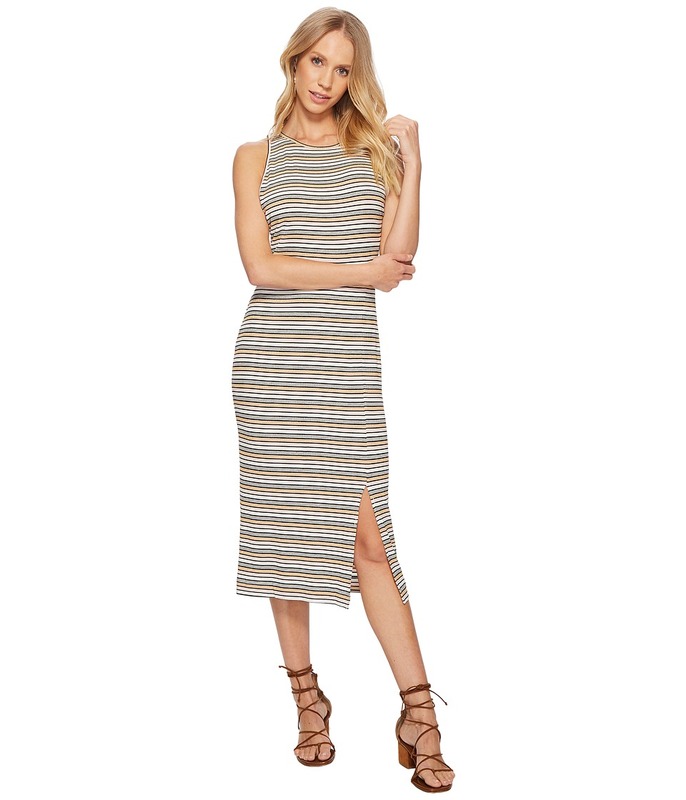 Midi dress in a wrap-inspired silhouette. Variegated panels add a stylish flair to this easy dress. V-neckline. Long sleeves with elastic cuffs. Self-ties at left side of elastic waist. Lined. Straight hemline. 100 percent rayon. Hand wash cold and hang dry in shade or dry clean. Imported. Slash hand pockets. Measurements: Length: 53 in Product measurements were taken using size SM. Please note that measurements may vary by size. The Jetset Diaries Gardenia Maxi Dress is a flattering choice for that special weekend getaway. Maxi silhouette. Combination of lace and fringe trim accents. Scoop neckline. Sheer long sleeves with cuffs. Lined. Floor-sweeping straight hemline. Rear zipper closure. Materials: 90 percent nylon, 10 percent spandex Lining: 95 percent polyester, 5 percent elastane Body lining: 98 percent polyester, 2 percent elastane. Hand wash cold, line dry in shade. Imported. Measurements: Length: 58 in Product measurements were taken using size SM. Please note that measurements may vary by size. 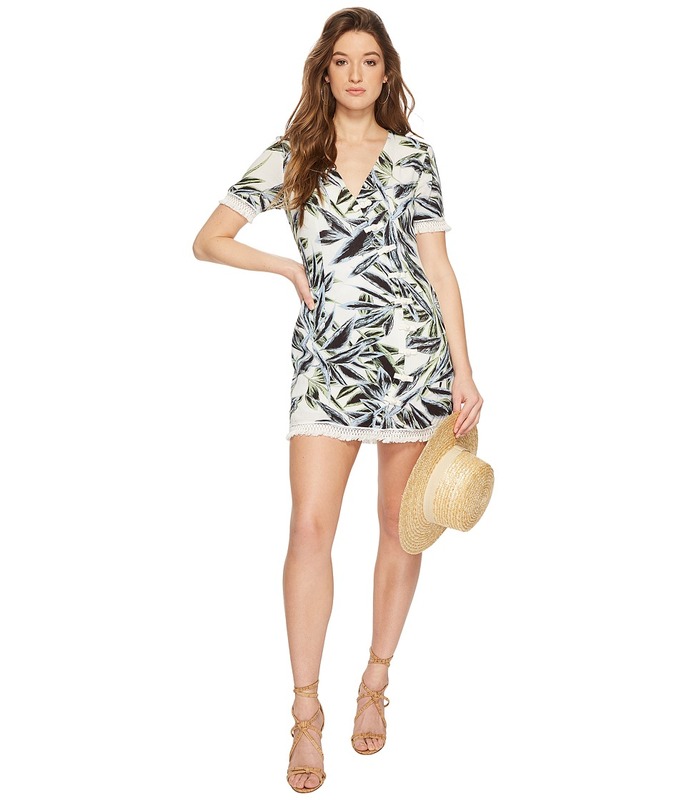 Rock a laid-back look with The Jetset Diaries Roller Girl Dress. Sleeveless midi dress in a sheath silhouette. Striped design on a stretch rayon-blend fabrication. Round neckline. Flirty side slit. Straight hemline. Slip-on. 86 percent rayon, 7 percent elastane, 7 percent lurex. Machine wash cold and hang dry in shade. Imported. Measurements: Length: 46 in Product measurements were taken using size SM. Please note that measurements may vary by size. 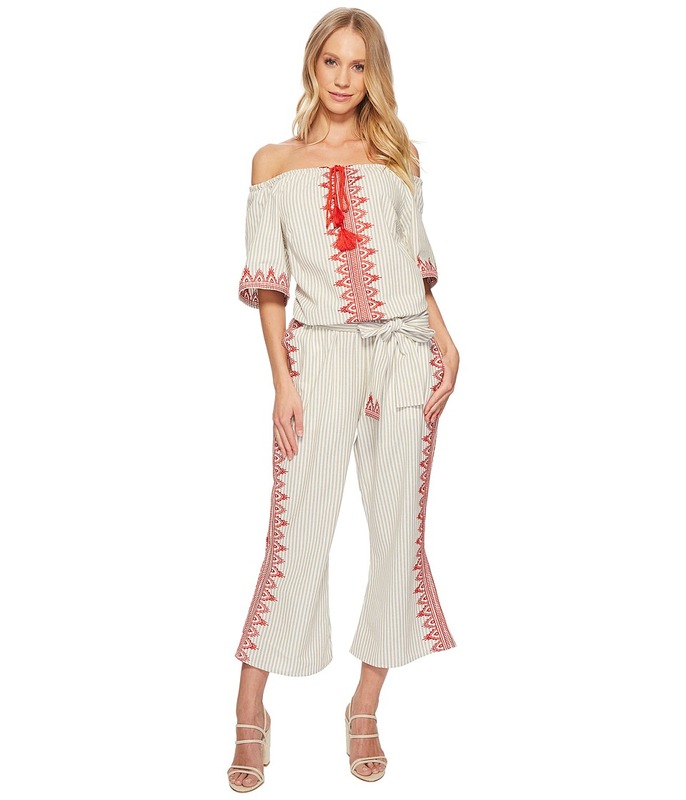 Show off your personal style in The Jetset Diaries Essence Jumpsuit. Off-the-shoulder jumpsuit in a relaxed fit. Linen-blend fabrication features a striped design throughout. Tassel ties at front. Short sleeves. Contrast trim throughout. Elastic waist with self-ties. Dual hand pockets. Flared legs at a cropped length. Lined. 60 percent polyester, 20 percent linen, 20 percent cotton Lining: 100 percent rayon. Hand wash cold and line dry in shade. Imported. Measurements: Inseam: 23 in Product measurements were taken using size SM. Please note that measurements may vary by size. Effortlessly transition from day to night in this standout The Jetset Diaries Arlo Mini Skirt. Mini skirt flaunts a geometric pattern all throughout on a lightweight cotton fabrication. Solid trim at the hemline. Fitted waist with exposed back zip closure. Straight hemline. Lined. 100 percent cotton Lining: 100 percent rayon. Hand wash and line dry. Imported. Measurements: Skirt Length: 15 in Waist Measurement: 26 in Product measurements were taken using size SM. Please note that measurements may vary by size. Get festival ready in your Lilith Mini Dress. Shift silhouette. Printed rayon fabrication features a contrast design at front yoke and cuffs. Round neckline. Long flared sleeves. Full button closure at front. Lined. Straight hemline. Main: 100 percent rayon Contrast: 100 percent rayon Lining: 100 percent polyester. Hand wash cold and line dry in shade. Imported. Measurements: Length: 33 in Product measurements were taken using size SM. Please note that measurements may vary by size. 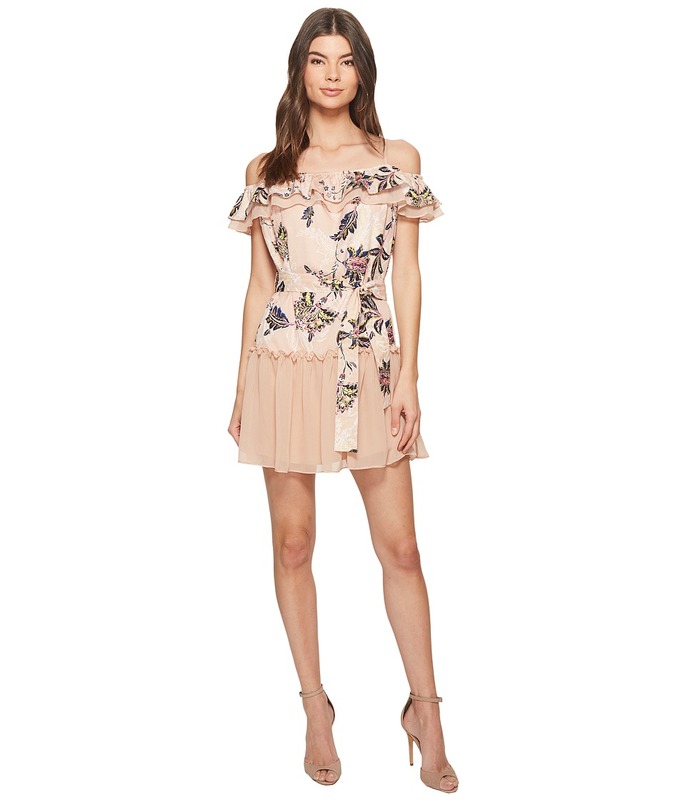 Take your style to the next level in the Azalea Mini Dress. Shift silhouette. Floral print throughout a poly fabrication. Solid-poly panel at neck and at skirt. Ruffled off-the-shoulder overlay at neck. Square neckline. Adjustable spaghetti straps. Removable self-ties at elastic waist. Lined. Straight hemline. 100 percent polyester Contrast: 100 percent polyester Lining: 100 percent rayon. Hand wash cold and hang dry in shade or dry clean. Imported. Measurements: Length: 26 in Product measurements were taken using size SM. Please note that measurements may vary by size.